Heat gas or charcoal grill. In medium bowl, mix ground beef, onion, bell pepper, Worcestershire sauce, seasoned salt, garlic powder and pepper until well blended. Shape mixture into 6 patties, 1/2 inch thick. Place patties on grill. Cover grill; cook over medium heat 13 to 15 minutes, turning once, until meat thermometer inserted in center of patties reads 160°F. To toast buns, place cut sides down on grill during last 1 to 2 minutes of cooking time. Top each patty with cheese slice; cook just until cheese is melted. Spread cut sides of toasted buns with sandwich spread; top with onion slices. 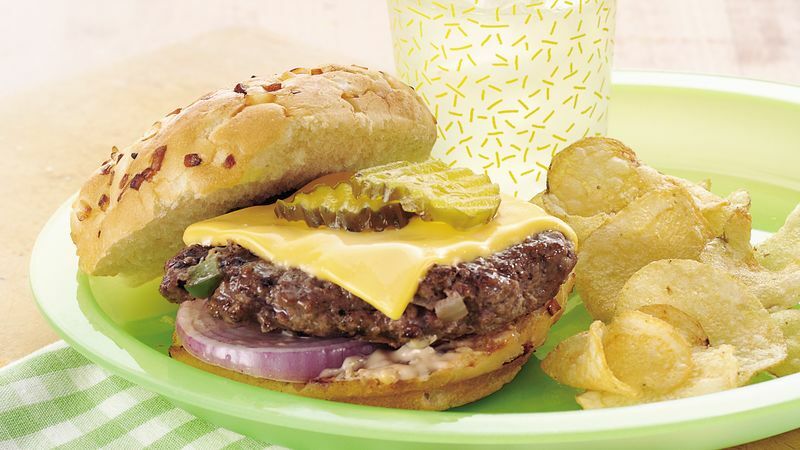 Place cheese-topped patties in buns. Sandwich spread is a mayonnaise-based product with pickle relish and special seasonings added for a tangy and slightly sweet flavor. Look for it in the mayonnaise section of the supermarket. This recipe is easy to double if you are entertaining a crowd. Just be sure you have space on your grill for 12 patties or cook them in batches.